Yesterday, the Left made significant gains in the election for local party representatives on Labour’s national policy forum (NPF), the roughly 200 strong body responsible for preparing the party’s rolling policy programme which is prepared for approval by the party’s conference. The Left is now the largest grouping amongst constituency representatives (having made 9net gains) with 27 successful candidates including those elected by young members, whilst 24 candidates backed by the right-wing Labour First were elected alongside 4 independents. The Left did not do as well in the first all-member election for Labour’s conference arrangements committee where Right backed candidates Gloria de Piero MP (who has now also taken a place in Jeremy Corbyn’s shadow cabinet) and former MEP and Eastenders character Michael Cashman beat Katy Clark and Jon Lansman of the left. In the East Midlands there was no change in the alignment of those elected, with three Right (identified as LF for Labour First – two of whom were incumbents) and one incumbent independent elected. In the East of England, two Left candidates (identified as GRA for Centre-Left Grassroots Alliance), Rachel Garnham and Jo-Ann Rust, were elected alongside two backed by the right (one of whom had previously been independent). In the North, the Left gained two places for their two candidates having previously held none, Laura Piddock and Mary Foy, with the right retain two. In the North West, the Left suffered from the decision by renegade Unite activist John Wiseman to resign as an NPF representative from the North West regional party (though he had failed to attend the crucial final meeting of the NPF in 2014) in order to stand against the agreed Left slate alongside one other candidate. As a result, the Left which had not previously held any seats only gained one for Lorraine Beavers. Those left candidates who lost as a result were Unite shop steward at Vauxhalls Councillor Paul Donovan, former Bakers Union executive member John Fox and former chair of the Campaign for Labour Party Democracy and parliamentary candidate Gaye Johnston. In Scotland, the Left which had won only one place in the last election won three out of four places for Martyn Cook who has been acting as the Scottish regional organiser of the Jeremy Corbyn campaign, Suzi Cullinane and Iona Baker. Unison activist Katrina Murray was also successful and, though she was backed by Labour First, could be regarded as centre-left. In the South East where the Right had previously held all four places, they retained none. Three centre-left candidates were returned – Bev Clack of Oxford, Simeon Elliott of Brighton and Unite executive council member Joyce Still who is not a member of Unite’s controlling broad left group, United Left, but of the more centrist Unite Now, and had campaigned for Andy Burnham as did the independent candidate elected, Fiona Dent of Maidenhead. In the South West, where three representatives elected last time had been backed by the Right, Doug Naysmith, the sole Left-backed member elected last time stood down and ex MEP Glyn Ford was this time elected without the backing of the Right alongside three Right-backed candidates, former member Brenda Weston and two new candidates. In Wales, the Left regained all four places except that Tony Beddow from Swansea replaced Cardiff councillor Darren Williams who is secretary of Welsh Labour Grassroots and is currently in pole position to stand next year for a place on Labour’s national executive as highest runner up from the last election. In the West Midlands where the Left has failed even to find wiling candidates in the recent past, it at least got a creditable score for its two candidates though the Right won all the places. In Yorkshire, the Left again won three places – with ex-MP Ann Cryer and NPF stalwart George McManus being re-elected alongside new candidates Emma Hardy for the Left and Right-backed Nikki Belfield. In a triumph for the Left’s Young Labour candidates which bodes well for the future of Young Labour which has for so long been dominated by the forces of the mis-named Progress, seven out of 11 places went to the Left – including but one where the position was contested – in Eastern, Yorkshire and Humberside, South East and South West regions, Scotland and Wales, left candidates won with the Right winning only in London and the North West. Three places were uncontested, however, with the Right taking those in the East and West Midlands and the Left the one in the North. In the Conference Arrangements Committee election, it appears that backing well-known names is the route to victory, at least in the much higher turnouts than are normal when the ballot is run in conjunction with a leadership ballot. 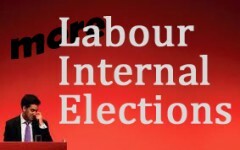 Ironically, the change to the party rules which introduced OMOV elections which had originally been promoted by the Campaign for Labour Party Democracy, was designed to bar members of the shadow cabinet from standing. However, the term used in the rule change was the “Parliamentary Committee” of the Parliamentary Labour Party which used to be the name by which the shadow cabinet was referred to in its standing orders. After the rule change was drafted but before it was agreed by the party conference, this term was applied instead to the backbench liaison committee of the Parliamentary Labour Party. Although the intent was clear, the nomination of Gloria de Piero was accepted as valid. Yes, a much improved result ( I make it 25 GRA, not 27) but only because the previous one was so awful. We only won all five seats here in Wales, and only a majority of the five seats in five of the eleven regions/nations. We failed to put up a full slate in five of these, and conceded the youth place in two by not putting up a candidate, although we gained one youth place for the same reason. Progress, but we could and should have done better. I think the NPF should be abolished – it was only set up as a fig leaf, then after serving its fake purpose deliberately ignored by the top down leaders. We can find more democratic and better ways of making grassroots bottom up policy including harnessing new technology. You do perhaps need a very brief document (what educationalists would call a ‘stimulus-response’) and here are some ideas (not set in concrete) but this should document should be very brief (one side of A4) and be written in simple and clear language. It could be sent by the leadership on different topics say every 3 months as well as making it available to supporters & affiliates and supporters on line (a lot of people can’t make meetings so we shouldn’t exclude them) but I guess you could also have e forums by CLP area? CLPS could hold open public meetings to discuss the topic which could be open to Labour supporters and say if housing those who are passionate about housing – amendments and additions could be made at these meeting and sent upwards and the meetings could be quite exciting! E forums could discuss things on line. Annual conference could then receive a report on each topic which would also be sent to CLPs and e groups. Resolutions from CLPs and e forums could also be sent as per usual at any time to generate policy in new areas. Just some food for thought and a work in progress I think.